Satan. What images does that word conjure up for you? An evil creature with horns, a tail, and a pitchfork? A cute kid in a red cape, ringing your doorbell on Halloween? Cultural caricatures aside, Satan is the personal being whom Christians know as the great deceiver, the archenemy of God and his people. Scripture says a lot about his character and actions—who he is and what he does—but what about his origins? Where did he come from? Who created the Devil? The story of the Bible opens with creation, with God declaring the universe into being. The first two chapters are a breathtaking scene of order and wholeness and flourishing. No wonder the Maker surveys everything he’s crafted and pronounces it “very good” (Gen. 1:31). Then, suddenly, a snake. But this isn’t any ordinary snake; this one talks. In fact, it’s quite chatty. 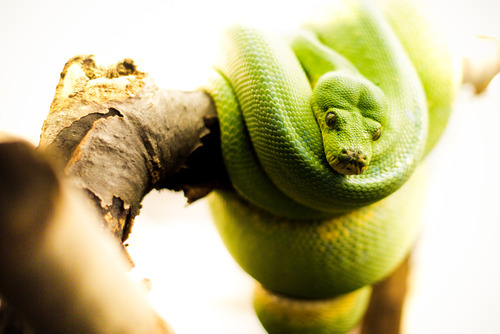 Before we know it, the slithering creature has struck up a conversation with Eve, luring her and her silent husband—and you and me—into a revolt against God. As the story unfolds, it becomes clear this ancient serpent is a scaly manifestation of Satan himself (Rev. 12:9). Scripture proclaims all things were created by God and for God (Rom 11:36; 1 Cor. 8:6; Col. 1:16–17). It makes sense, then, that this comprehensive category—“all things”—includes even the Devil. After all, if God wasn’t “behind” Satan’s creation, then who was? Another powerful being? If so, then that being would, at least in one sphere of existence, be in charge. There would be a realm over which God wouldn’t be in full control. 2. God created him good. As the source of all goodness, beauty, and truth, God creates only what’s consistent with his nature—things that are themselves good, beautiful, and true. Every facet of creation, whether in heaven or on earth, was originally “very good.” As Paul simply observes, “Everything created by God is good” (1 Tim. 4:4). His character is wholly pure; there isn’t a shred of darkness or deception in him (1 John 1:5; James 1:13). And Satan was created as an angel to serve and honor this great God. 3. Some created angels rebelled against God. According to Scripture, there was once an angelic insurrection against heaven’s King. 4. Satan has authority in the realm of demons. As the “prince of demons,” it seems likely that Satan launched and led this heavenly revolt (Matt. 12:24). Satan, then, was the first sinner; indeed, he’s “been sinning from the beginning” (1 John 3:8). The Devil’s position as captain of the demonic forces is unmistakable. Scripture refers to him as “the evil one” (Matt. 13:19), “the ruler of this world” (John 12:31), “the god of this age” (2 Cor. 4:4), and “the prince of the power of the air” (Eph. 2:2). We witness him spearheading attacks on God’s people (Job 1:6; 1 Chron. 21:1; Zech 3:1), with “power” (Acts 26:18) to “bind” (Luke 13:16) and “oppress” (Acts 10:38). 5. Satan’s evil came from within himself. No one was around to tempt and lure Satan into sin; his evil arose from within. It’s not surprising, then, that Jesus would call him “the father of lies” and “a murderer from the beginning” (John 8:44)—language hearkening back to the outset of history. The King James Version translates “morning star” as “Lucifer,” a name meaning “bearer of light.” Though common in religious vernacular, this name doesn’t appear in most modern translations of the Bible. In sum, while it isn’t certain that this passage alludes to Satan’s pride and subsequent fall from heaven, it definitely could. We are swimming in the deep end of the mystery pool, with many unanswered questions on which the Scriptures are simply silent. How could a morally pure creature rebel against God? Why did the other angels join the revolt? When did all of this happen? Even though Christians don’t know all the answers, we know the God who does. And we know that “the reason the Son of God appeared was to destroy the works of the devil” (1 John 3:8). If you’re following King Jesus, take heart. Your enemy was defeated (Col. 2:13–15), he is being defeated (Eph. 6:10–20), and he will be defeated (Rom. 16:20). Yes, he “prowls around like a roaring lion, seeking someone to devour” (1 Pet. 5:8), but at Jesus’s death he was defanged, and at Jesus’s return he’ll be destroyed. In the meantime, his havoc extends only as far as God’s hand allows. 1 These five points are derived from Mike McKinley’s helpful book Did the Devil Make Me Do It? And Other Questions About Satan, Demons, and Evil Spirits (The Good Book Company, 2013), 12–13 [excerpt]. Editors’ note: A version of this article appeared at ExploreGod.com.